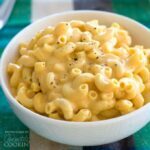 Crockpot Macaroni and Cheese: creamy mac and cheese in the crockpot! 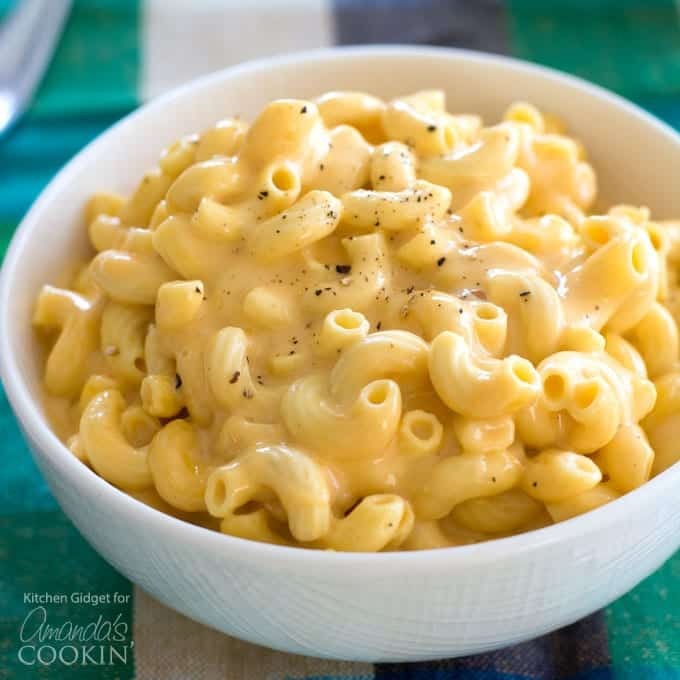 This creamy crockpot macaroni and cheese starts with uncooked elbow pasta; no boiling these noodles. Simply throw the milk, cheese, and seasonings in the slow cooker for a meal everyone will love! We’ve also made homemade stovetop macaroni and cheese and baked macaroni and cheese, but the slow cooker is super portable and the dish won’t dry out. This is a great casserole to take to a potluck or family get together. I love cheese. I love the variety and how it spans cultures from Italian Beef and Cheese Manicotti to Mexican Corn in a Cup. 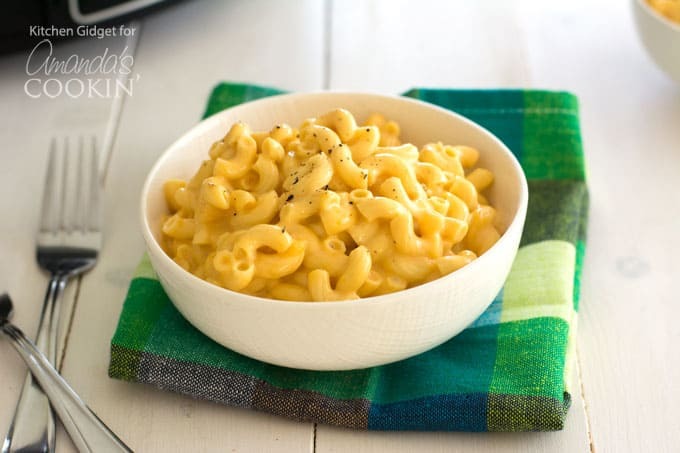 Today, I’ve got an American classic – creamy crockpot macaroni. Hard to believe I first had slow cooker macaroni and cheese five years ago! I remember it so clearly because everyone at the potluck thought it was a genius idea to throw it together, keep warm (not on the warm setting, turned off with the lid on) and transport. Everyone loves mac and cheese. Just remember that next time you need a dish to pass! There are two main types of macaroni and cheese. 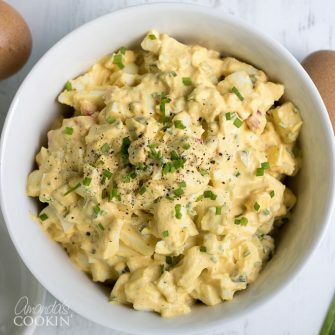 The first type is southern or baked mac and cheese, which includes eggs and is almost like a casserole. The second type is cooked on the stovetop in a béchamel sauce. There are no eggs and it is super creamy. 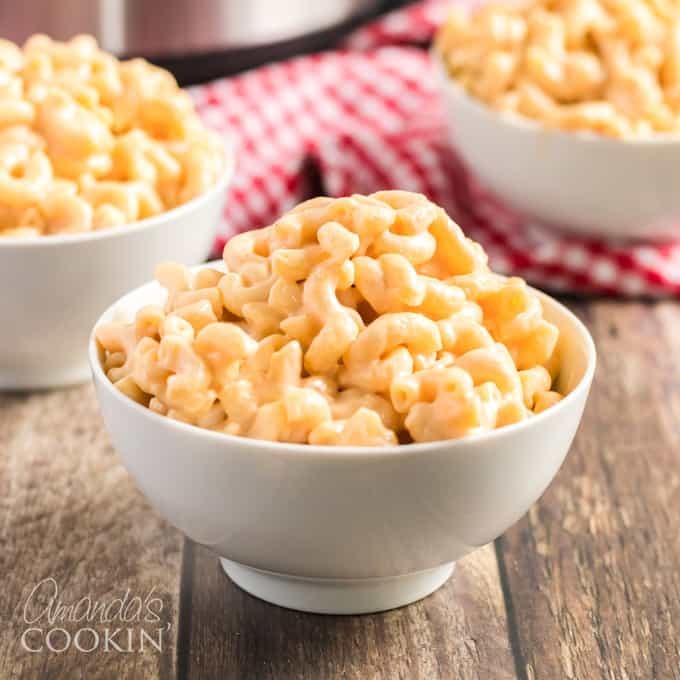 I love the slow cooker recipe I have, but it’s southern–style and I wanted creamy crockpot macaroni, so I turned to the internet in search of inspiration. I also did not want to pre-boil the pasta, which a lot of recipes call for. To me, that defeated the purpose of using my slow cooker. RELATED: This Macaroni and Cheese Casserole with Ham in Peas is a crowd pleaser and great for holiday breakfast! Our Crockpot Chicken and Dumplings soup is another huge hitter when it comes to family favorites! The best part is how easy it is to make! Turns out that in order to get that ultra creamy texture in a crockpot, you either have to use condensed cheese soup or Velveeta cheese, neither of which appealed to me. The next best thing is to use evaporated milk and American cheese, the kind you get from the deli counter. Barring American cheese, using a melty cheese like Monterey Jack or White American will also produce creamy results. To this, I also added lots of sharp cheddar. This gives it that great mac and cheese flavor, but it is not the best kind of cheese for melting. For best results, buy a brick and shred it at home since the pre-shredded cheese comes coated in anti-caking agents. I use my food processor and it’s done in the blink of an eye! If you’ve never made this before, please do a dry run before the holiday! Everyone’s slow cooker acts differently, so it’s important to try this out first. Please read through the FAQ below as well for best results. Happy Thanksgiving and Merry Christmas! There have been quite a few questions on this recipe, please check here before asking in the comments as it may already have been answered. PLEASE READ the notes in the printed recipe. Can I double this recipe and does it change the cooking time? Yes, this recipe can be doubled provided you have a large enough slow cooker. The cooking time will not change. The recipe says to use uncooked noodles, however, it also says to rinse the pasta? Yes, rinse the uncooked pasta simply to remove any dust and foreign particles from the manufacturing plant. I don’t eat yellow cheese, what is a good white substitute? Monterey Jack works well, as does White American and White Cheddar. A marble cheese should work as well. Can I make this ahead and reheat it? We don’t recommend reheating macaroni and cheese as it never tastes quite the same and there’s a possibility that the macaroni will become mushy. However, if this is a deal breaker, you can reheat it – simply add some milk to loosen the thickened sauce while reheating. We recommend making it and having it ready right before you leave. Turn off the slow cooker but leave the lid on. When you arrive stir it and loosen with milk if needed. This serves 6-8 people. A serving size is 2 ounces of dry pasta which expands to approximately 1.5 cups with sauce when cooked. Why was my mac and cheese gritty? Prepackaged shredded cheese contains an anti-caking agent that can cause your final product to taste gritty. Purchase your cheese from the deli and shred it yourself. Why was my mac and cheese mushy? If it cooks too fast or too long it will get mushy. The biggest culprit is an older slow cooker that may cook hotter (even on low) than a newer slow cooker. Leave the lid on for one hour on low. DON’T increase the temp to High! Stir after one hour then check after 30 more minutes. Check and stir every 15 minutes after that if needed. Mine was done is 1 hour and 45 minutes. Can I mix all of the ingredients, refrigerate overnight, and put in the crockpot a few hours prior to serving? Yes, with the exception of the pasta. Wait until you take it out of the fridge and are turning the slow cooker on before you add the macaroni. I’m confused by the cooking time, is it 2 hours or 3? Actually, it’s up to 3 hours. You should cook the dish on low for 1 hour, then stir it and check for doneness. After that, check it periodically (every thirty minutes or so) until it is done. The actual cooking time is completely dependent on the slow cooker you have (similar to ovens, they all cook differently), hence the “up to 3 hours” instruction. Can I use regular milk instead of evaporated milk? Don’t use regular milk. However, you can create your own evaporated milk. To make 1 cup of evaporated milk, simmer 2 1/4 cups of regular milk down until it becomes 1 cup. Is evaporated milk the same as condensed milk? Condensed milk is sweetened and the two cannot be used interchangeably. While scrolling through recipe reviews, many cooks noted that the mac and cheese was bland. I hate bland food, so I remedied this by adding mustard, garlic, and cayenne to my dish in addition to the basic salt and pepper. These can all be adjusted to your taste. RELATED: Bought too much elbow macaroni? Try our Chili Mac for dinner, or this easy tuna pasta salad for your next get together! It’s very important that you check the mac and cheese every so often. Pasta is not an ingredient that can cook all day or it will turn to mush. Slow cookers vary by brand and size, so keep an eye on it after the first hour. Mine was perfectly al dente around 90 minutes in a 6-quart cooker. It’s still less hands-on than babysitting a béchamel sauce on the stove or dirtying up a number of dishes! We sure love our Mac and Cheese around here. 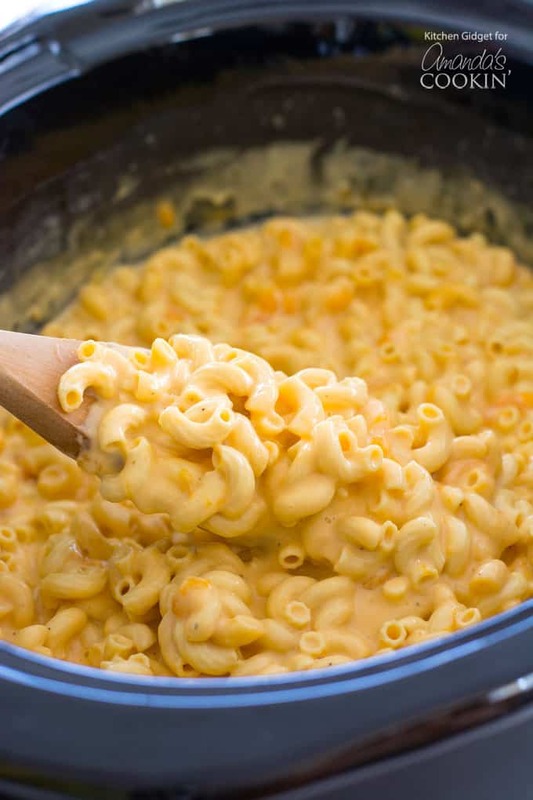 If you have an Instant Pot at home, put it to the test with this creamy, delicious Instant Pot Mac and Cheese. You won’t be disappointed! Don’t miss one of the most popular dinner recipes on the blog- Bacon Cheeseburger Pasta. It’s the perfect weeknight dinner, but beware, once you make it everyone will be asking for it again and again! 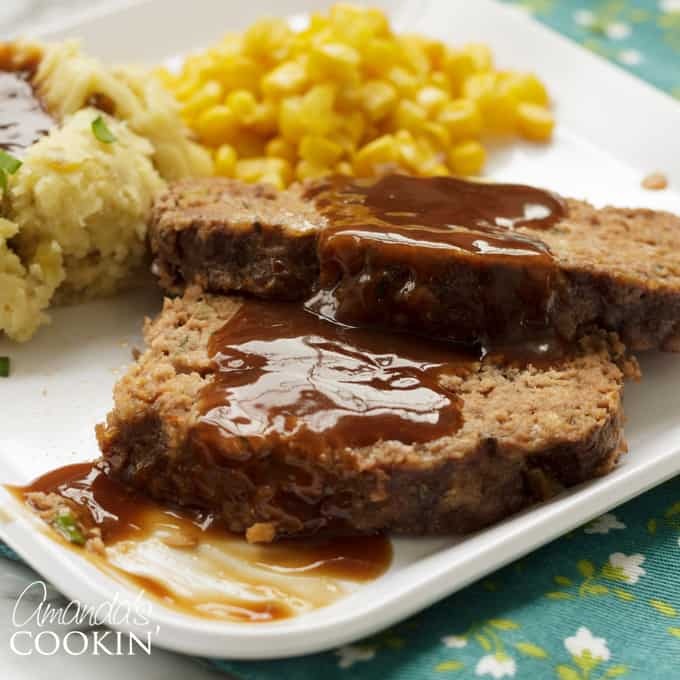 Lastly, pair your delicious mac and cheese with the best meatloaf EVER! Creating a delicious, comforting dinner. This creamy crockpot mac and cheese starts with uncooked macaroni. Just throw the milk, cheese and seasonings in the slow cooker for a meal everyone will love! Spray 6-quart slow cooker with non-stick spray. Rinse the uncooked pasta well in cold water and drain. Add uncooked pasta to crockpot along with milks, cheeses, salt, pepper, mustard, garlic and cayenne pepper. Stir to combine, making sure macaroni is submerged in liquid as much as possible. Cover and cook on low heat for 1 hour. Remove lid and stir. Depending on your slow cooker, your dish could be done at this point or require UP TO 1-2 more hours. If not done, continue cooking and checking periodically (ever half hour or so). When done, pasta will be tender and liquid will be thick and creamy. IMPORTANT - please do not use the bagged shredded cheese. It contains an anti-caking agent that can make your mac and cheese gritty. Get the cheese from the deli and shred it yourself. Also, every slow cooker is different. Newer slow cookers should work fine for this recipe. Cook on low for one hour without disturbing. Remove lid and stir well. Replace lid and check after 30 more minutes. DO NOT turn the heat up! You will make your macaroni mushy. My slow cooker is only a couple years old and my mac and cheese is done after about 1 hr and 45 minutes. Is there something wrong with using gluten free noodles? My daughter had an egg allergy so these are normally the noodles we use. Would it still be okay to use them? Hi Lauren. We have not personally tried this with gluten free noodles (yet), but commenters have said that the gluten free noodles do not hold up well and get very mushy. This turned out great! Thank you! Just made a few changes because I either didn’t have something or because of other’s comments: Did not have evaporated milk so used half and half; used white pepper instead of black pepper; used actually only two tablespoons of butter to dot the top with; and I didn’t put in garlic powder or cayenne but did add 1/2 tsp. Turmeric (it’s orange anyway, and it’s good for you), and lastly, I added two ounces of cream cheese. So glad you liked it Tricia! We have NOT tried that but have heard that gluten free pastas do not hold up well in this recipe. I made this for my family. Instead of having a whole can of evaporated milk I only had the 5 oz. size. So I substituted 1 % milk for 7 ounces of it. I also used 1% for the other milk. For the cheese I had shredded Mexican cheese (4 kinds) and then about a handful more. I did use American sliced cheese (4 ounces) of it. I omitted the cayenne pepper. My family loved it!!! I am now going to be making it this way again for them because the flavor was wonderful. I really loved it much better than some I have tried. Thanks for the recipe. I tried this today and was really disappointed. It had an odd taste which I attribute this to the evaporated milk. 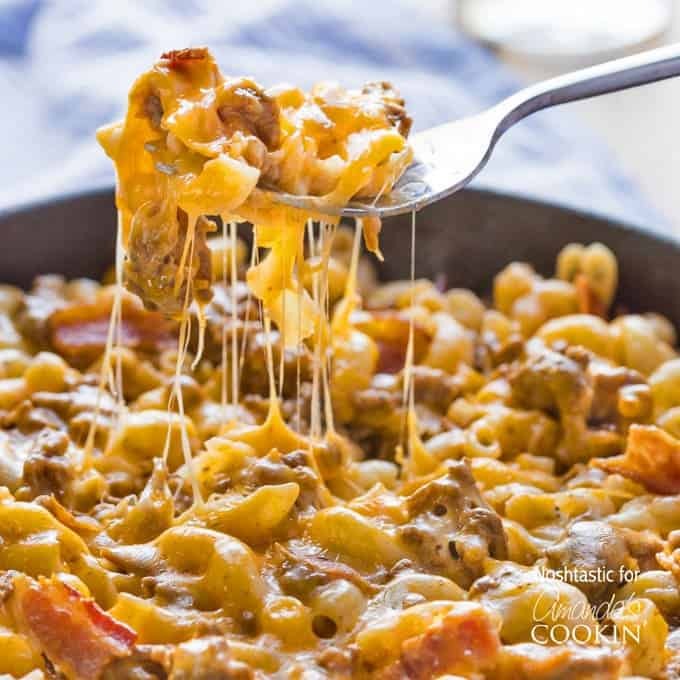 This recipe is the same as my baked Mac and cheese except for the evaporated milk so that’s why I think it is the evaporated milk. My 10 year old grandson didn’t even like it that’s how bad it was. Sorry you didn’t like it Pam! That’s odd. I’ve made this and taken several different places and it’s always gone. Everyone loves it. Can I omit the monteray jack cheese? Yes, but replace it with another cheese so that you are using the same amount of cheese. Curious can this be doubled? We haven’t doubled it ourselves, but several people in the comments have said yes. Hi Rachel. It may have been the type of pasta you used. I have only ever used Barilla in the blue box. I have heard that people have had trouble with the gluten free or whole wheat varieties. This was amazing so tasty and creamy. Thanks for sharing this fantastic recipe. I’ve tried this recipe a total of 3 times! The first time, I used pre-shredded cheeses. I used a crockpot that has a couple hot spots, which caused certain spots to burn faster. When I tried it, the Mac wasn’t great. My fault! The second time, I used pre-shredded cheeses and I used heavy whipping cream instead of evap milk. Oh and I didn’t add some of the spices that I didn’t have. Again, turned out ok. Oh and it was very greasy. My fault again! Yesterday, Thanksgiving 2018, I used block cheese that I shredded myself, which improved the texture and taste of the mac. I used 3 tbsp. of butter to solve the greasiness problem. I stuck to the milk measurements and used evap milk. I did not use the mustard seasoning that I still haven’t purchased. This time I added the cheese slowly throughout the cooking time so it doesn’t burn (on the hotspots). This Mac and cheese came out soooooooooo delicious. It was tender, it was creamy, it was not too cheese or greasy. The taste was phenomenal!! Sounds wonderful! Thanks so much for sharing your notes! How would I make this in the oven? Hi Amanda. Love your site. I have to bring mac and cheese to an after Thanksgiving meal. It is 2.5 hours away, so I am planning to leave around 11:30 for a 2 o’clock meal, and the host wants it to arrive hot as she wont have oven space. Any ideas of how I can accomplish this with your recipe? I was planning on buying this Presto Nomad travel slow-cooker that looks like a little cooler that should keep things hotter through travel, but it will not be plugged in so it will not be on. I was going to cook pasta and make a cheese sauce the day before, then combine and heat it up on the stove and then transfer it to the pre-warmed slow cooker. Do you have any suggestions? How much do I undercook the pasta? And wouldn’t I want to make the cheese sauce soupier than normal? I have never done this. Any suggestions would be greatly appreciated. Thanks and happy Thanksgiving. It turned out so bad we could not eat it. Just mush. I will go back to my own mac and cheese. Sorry it didn’t work for you! Love the kick! I have made this 2 years in a row for the cross country team pasta parties and the kids love it! More than one asked me to send it to their mom’s! Doesn’t take long to cook (depending on crock pot) and yes, don’t use the pre-packaged shredded cheese, too stringy. Thanks for the great recipe! So glad you enjoy it as much as we do Michelle, thanks!